Air Plants – If you live with your cats, you may well know there are tons of toxic, poisonous flowers and plants you have to avoid for your feline friends. However we still want to enjoy some natural thing, right? We’ve collected a list of plants, which are supposed to be safe to your kitty and also good looking ones. We will take a look some cool Air Plants ideas today! What are the air plants, you say? Tillandsia is their scientific name, native to the forests, mountains, and deserts of Central and South America, the southern United States, and the West Indies. 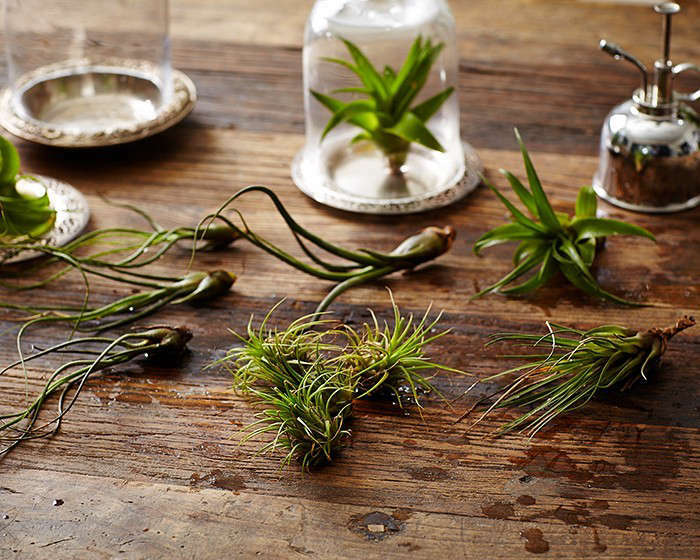 The greatest characteristic of air plants is that they can survive without roots, without soil. You just take care of them by watering them once or twice a week (depends on the season). Fertilizing your plants is not necessary, but will keep them in top shape and should promote blooming and reproduction. They live on air, but you definitely need to water. While the plants can survive for long periods of drought, they will not grow or thrive and will eventually die off if water is too scarce. As the main method of watering your plants, letting them soak in a bath of water for 20-30 minutes. After their shower or bath, gently shake the plants to remove any excess water from the base and the leaves, and set out to dry in an area with enough air circulation to dry them out in about 4 hours. If your plants need an in-between watering, misting them with a spray bottle is a great method. It’s ok to water them once per week, but it’d be better if you can water 2-3 times. If you are in a drier, hotter climate, more frequent watering or misting will be needed. You’ll notice wrinkled or rolled leaves can be a sign of dehydration. You watch them carefully, you’ll recognize plant’s leaves will feel stiffer and full of water after watering. These clear glass planters allow you to create a hanging indoor garden. Just be sure to hang them where they’ll receive natural light. When placing air plants into vessels like this glass orb, be sure that the vessel’s opening will easily accommodate your plant. You can use some stick, base, and wire to make trees out of them like above. It’s pretty nice. It is amazing you can put air plants on the wall like above, again using wire and a box, you can decorate your wall with live plants. You can put your them in a jar like above. It looks antique and something really precious. If you can find a piece of wood like above, you can add even more natural atmosphere in your room. It’s really a warm touch. With your imagination and taking a proper care, which doesn’t require a lot, you can make your own air plants creation while knowing they would not be harmful to your kitty! … But always watch carefully your cat’s reaction as every individual have a different tolerance. Interested in air plants? You can find the best shop to match your taste and needs from this page.